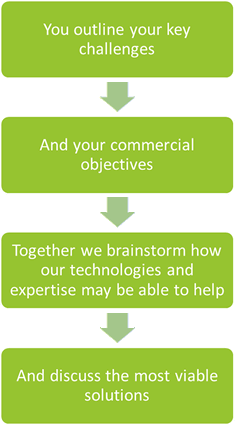 We're firm believers in working in partnership with you, becoming an extension of your team to tackle challenges and to develop new products and technologies together. Innovation is key to what we do. And we combine this with out-of-the-box thinking, cross-industry technology transfer, world-leading materials expertise, and our comprehensive suite of analytical capabilities to create solutions for you. In 2018 we're offering free Innovation Sessions – a chance for you to explain your challenges and for us to explore how we can help you to solve them. After the session we will then put together a discussion document on how we can move forwards, by working together on projects that will have the most impact for you. Once we have received your feedback, we will generate a proposal with a full schedule.